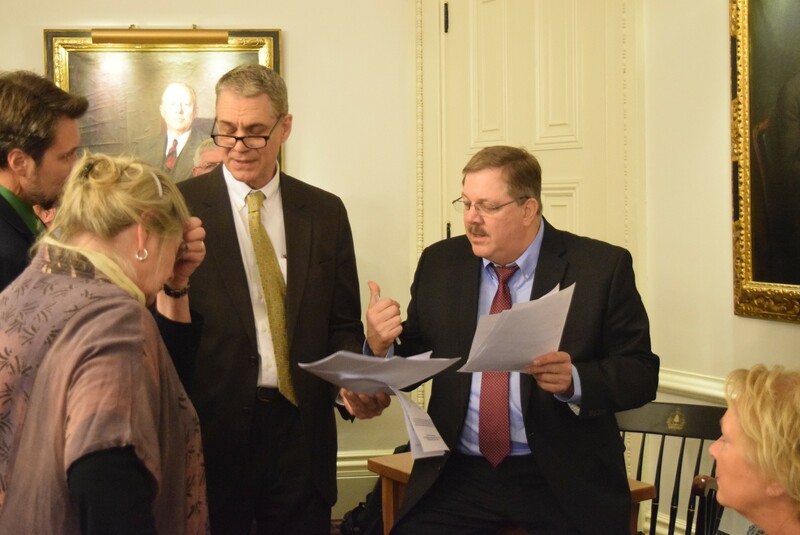 Secretary of State Jim Condos (right) confers over election numbers with Senate Secretary John Bloomer, Deputy Secretary of State Chris Winters and Sen. Jeanette White on Thursday. When Sen. Jeanette White (D-Windham) read off the Vermont election vote totals during a joint session of the House and Senate on Thursday morning, something didn’t sound right. Liberty Union candidate Boots Wardinski surely didn’t get 69,000 votes, thought Rep. Kurt Wright (R-Burlington) as he heard the number. Indeed, Wardinski tallied just 7,038 votes — but legislators had come within a whisker of certifying the wrong numbers. “It’s actually pretty serious,” Wright said as the legislature’s canvassing committee reconvened to figure out what went wrong. What went wrong was that the Secretary of State’s Office inadvertently sent over incorrect numbers, Secretary of State Jim Condos conceded. “I’m embarrassed about this,” Condos told the canvassing committee. Such an error would have kept lieutenant governor-elect David Zuckerman under 50 percent of the vote, which would have sent the election to the legislature for another vote. Deputy Secretary of State Chris Winters said certifying the incorrect numbers could have opened the state to a legal challenge about the election. As the canvassing committee awaited corrected numbers, jokes flew. “Maybe we can blame the Russians,” Winters quipped. While the Secretary of State’s Office provided the wrong numbers, the canvassing committee on Wednesday went along with them. It was only when the numbers were read aloud on the House floor Thursday that the error was noticed. The joint House and Senate finished certifying the correct numbers just in time for the Senate to swear in Zuckerman. He really did win more than 50 percent of the vote, they determined, allowing him to officially take office.